"Before the filtered tube and still for the purist"
A few days after this site made its debut the UPS guy, Shawn, as a matter of fact, showed up at my office with a package for me from HBI, a company in Arizona that is a wholesaler and manufacturer of both herbal products and hemp, rice, and other kinds of rolling papers. Inside was a huge assortment of some of the coolest rolling papers I have seen, so naturally the subject of this issue's rolling paper review was no longer a difficult decision. As we stated in our last issue, rolling papers are marketed for their interesting covers as much as for the quality of the papers inside. That is not to say that the brands of papers inside these various artful packages are of poor quality. As a matter of fact, nearly all papers we have looked at are of very high quality and all do the job for which they were designed admirably. But occasionally we run into papers that seem to have a bit of an edge over their peers, which was why we chose Rizla papers for our debut issue. The group of papers HBI sent us passed all of our tests handily (basically rolling and smoking) but we found unique characteristics among them that made for interesting conversation and hopefully, an interesting review. So now let's take a look at six different papers which we can honestly urge you to try should you discover them at your favorite shop that handles such things. The Sawah, an ultra thin paper from the orient (China, we believe), is extremely soft and easy to roll. Unlike most papers of this sheerness, it is not as translucent as one might expect. 77mm (25.4mm/inch - you do the math) in length it is a bit long for some hand rollers like the automatic rolling box, I found this to be my favorite because of its soft luxurious feel. Like all the papers in this review, the gummed area was sufficient for a good seal. Some papers are actually manufactured without a gummed edge, but I have had little luck getting those to hold tobacco properly. 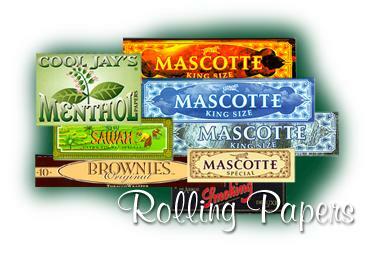 Next in line is the Smoking Brand of rolling papers from Spain. The thin papers are pretty translucent, thin and well made. With a length of 78mm they are also too long for some rollers like the Rizla Automatic Rolling Box which, by the way, we review this time in our Rollers section. (Clicking the link at left will open a new window, which you can close when finished and be right back here.) However, there are many longer rollers now available, so you need to check at the time of roller purchase which papers are ideally suited for a given roller. Many of the papers sent to us by HBI were made by Mascotte, a French company with quite a large following in Europe. These were all exquisite papers. The larger ones are 110 mm in length and really sheer and translucent. Just beautiful, and though they come with various cover colors and designs, these extra long papers appeared to be identical. A smaller version is also available in 70mm which fits the Rizla Automatic Rolling Box perfectly. This particular paper is not nearly as sheer as the larger ones but is very nicely made nonetheless. Of the many papers supplied to us by HBI, The Brownie Original distributed in the US by the Brown Sack Trading Company of New York City is unique among papers I have seen in the last few years. Many years ago, we used to be able to find a dark "chocolate" paper that felt and looked almost like vinyl paneling with flags on it (I have no idea what it was actually made of - and I don't think I want to know, but it tasted good). It was definitely unusual but not this unusual. This German paper is actually made from tobacco and tastes unbelievably good as part of a cigarette. The paper almost looks like it was made from a pressed tobacco leaf and though I doubt it is 100% tobacco, the tobacco flavor of the paper blends perfectly with the roll inside and were they not so expensive (as you only get 10 papers to a pack, I assume the cost is high), I would consider them over filtered tubes. The long length (100mm) and density of the paper makes for a very mild, cool and rich smoke.